Reliance student travel insurance is specially designed for the Students who are planning for the further studies in abroad.Studying abroad is an exciting prospect. There will be new places to explore, opportunity to meet people from around the world, but there’s always a little nervousness! What if something happens? Who will help me? Well, we will help you in case there’s an emergency. Reliance general insurance gives you an opportunity that is reliance travel insurance plan which covers many risks like Emergency expenses,study interruption etc. Automated extensions of Policy in case of medical emergency and evacuation (upto 30 days) and delay of common carrier (up to 7 days) beyond Policy expiry. Quick and hassle-free settlement for your claims. 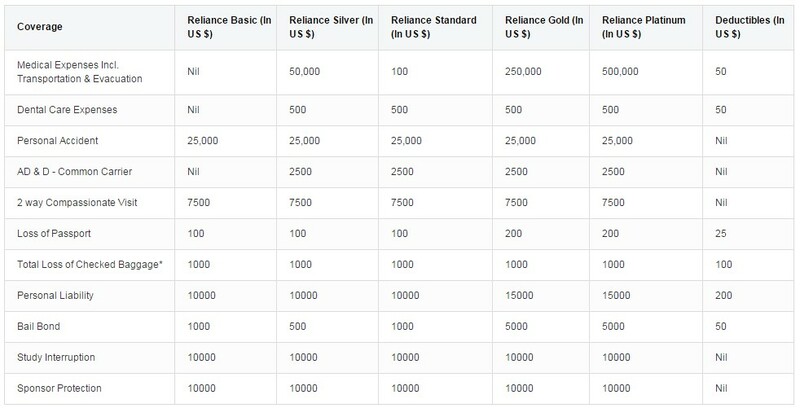 Reliance travel insurance policy has a Custom made Plans are Platinum, Gold, Silver, Standard and Basic that are available for students to choose from depending on his/her and the university’s requirements. In case the sponsor, who is taking care of the Insured Person tuition fees is injured resulting in his demise, the Company will reimburse the tuition fees. The company will reimburse the return fare for an immediate family member to visit you or for you to visit your family member in case of hospitalisation extending to more than seven consecutive days. Payment of bail amount to the appropriate authority, if you’re arrested or detained by any judicial authorities for a bailable offence, while abroad. Reimbursement of current (paid) semester fee, if your education is interrupted due to a medical condition. Reimbursement of tuition fees, in case the sponsor paying your fee passes away due to an injury. Europ Assistance India Pvt. Ltd. Original bills/receipts/invoices pertaining to expenses incurred/purchases made during the delay period. Any other documents relevant to the incident, including Summons, legal notice etc. Notify your claim at the Europ Assistance call centre. If, due to circumstance, you’re not able to do so, ask one of your relatives / friends / colleagues to notify the claim on your behalf. Apart from that, keep the following in mind for making claims under a particular section / type. Traveling against the advice of a physician. Receiving or are on a waiting list for specified medical treatment. Travelling to receive treatment abroad. Have been given terminal prognosis for a medical condition. Issues faced due to theft or loss of passport when left unattended, or unreported to local police authorities. If you need more information about the policy, feel free to call us on 1800 3009 (Toll free) or take a free quick quote to know your premium. 1.Can I extend my policy? If your holiday is extended for any reason, we recommend that you extend your policy. It always better to be safe than sorry! Bought your policy though an agent? Fill out this extension form and send it across to your agent, who will do the rest. Download and fill this extension form and mail it to us rgicl.services@relianceada.com along with contacts details (name, address & number) of theperson, who will pay the extension premium on your behalf. 2.How can I cancel my policy? A.To cancel your policy, all you have to do is submit a letter at any of our branch offices. Once we receive a written request from you, your policy will be cancelled within one day. 3.Will I get refund if I cancel the policy? A. The policy bought online will be cancelled and the amount refunded on a pro-rata basis provided no claims have been made subject to minimum 30 days left for the policy to expire. 4.How many times can we extend the policy in one year duration? A.You can extend the policy any number of times provided the total duration of the policy is less than or equal to 360 days. 5.What happens if the flight is delayed? A.In case your flight is delayed for more than 12 hours from the scheduled time, due to unforeseen circumstances like illness, death, delay due to bad weather, natural disaster, we will reimburse to you up to the maximum amount as mentioned in your policy.